European Cuisine Books from C.H.I.P.S. This incredible series of books, packed with full color photos, contains hundreds of recipes from some of the finest and most celebrated chefs in Europe. Each hardcover volume measures 12" x 9" and has more than 300 high-quality pages. Five professional volumes = five essential "tools"
The pastry trolley in your dining room will be the envy of all! 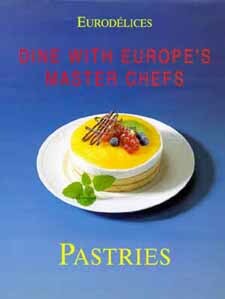 This book from Europe, translated from the German edition, contains hundreds of ideas for the pastry chef. Each creation is shown in a full page, full-color photograph. Additionally, full color, step-by-step photos accompany the recipes to demonstrate the techniques. This book contains hundreds of recipes from some of the finest and most celebrated chefs in Europe. It measures 12" x 9" and has more than 300 high-quality pages.